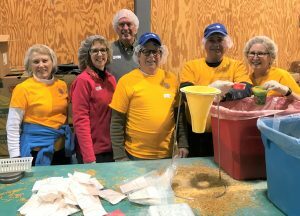 On Saturday, March 3rd, Greensboro Rotary Club members teamed up with Summit Rotary Club and other Greensboro area clubs to pack 100,000 meals in one day. This project is conducted through Meals of Hope, a 501(c)3 that started with the idea of making nutritious meals available to children that are hungry and facing food insecurity right here in our community. To a child who is dealing with the stress and insecurity of not knowing how or when they will receive their next meal, a comforting bowl of Macaroni and Cheese (fortified with soy protein and 21 vitamins and minerals), provides a bit of hope to carry them through another day. Club members making a difference by packing nutritious meals.